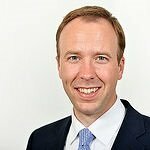 Matt Hancock was appointed as the minister for digital and culture during the cabinet reshuffle in July 2016, taking over from Ed Vaizey. In his new role, Hancock’s responsibilities include broadband, cyber security, digital strategy for enterprise and technology, and data protection. Prior to his appointment, Hancock was Cabinet Office minister and paymaster general.